Since I am making myself an Inverness Cape, I thought it only proper to make myself a black silk cravat to go with it. Looking at the ones Jon Pertwee wore, I can see the pattern is near identical to the one I use for my Six Cravats (see left), so I am going to use this as my starting point. I have looked around for some silk to use, and have chosen some Sapphire Satin. This is thicker than lining fabric, and it has a nice sheen to it (see below). First thing I need to do is draw a block for it. 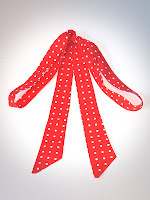 This will be the finished cut size of the cravat, and for the moment, all I need is one end. To keep everything together, I draw this on the main Inverness cape block in a clear-space area, using a Six Cravat as my guide, but making the point less acute, but a little wider (see below, top left). Then, using some pattern paper, I trace off the shape I have drawn, adding seam allowance to the bottom and outside edges only (see below, top right). 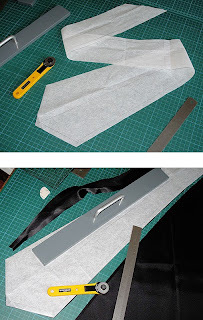 Using the long edge of my shape as a centre-line, I flip the pattern paper over and trace a mirror of the cravat, again with seam allowance on the bottom and outside edges only (see above, bottom left). Finally, at the far end, I draw a seamline at 45˚ using my pattern grader (see above, bottom right). I then cut this all out to the seam allowance, giving me my working pattern (see left, top). 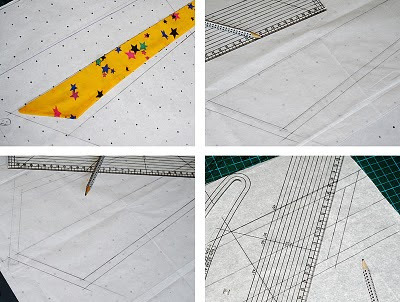 I then cut my fabric to shape, which I need to do on the cross (see left, bottom). The first thing to do is join the two parts together at the centre. 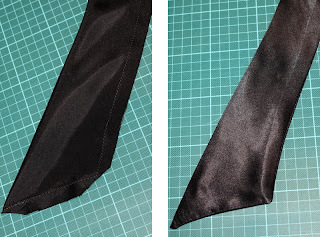 This is done with a seam that runs diagonally across the tie, so that once it is sewn and finished all the seam allowance is not at the same point causing bulking (see below, left). The seam is opened and pressed flat (see below, right). 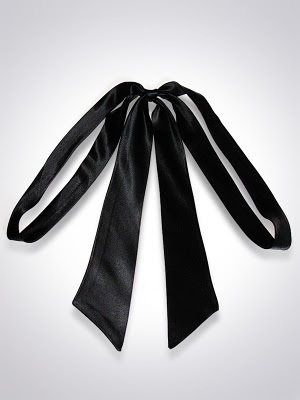 Next, I fold the tie along its entire length and pin it as close to the edge as a dare every 8 inches or so. I do this so the pin marks are in what will become the seam allowance, and not show on the finished cravat. I can then stitch from the point towards the centre back (see left), doing the same from the other end, but leaving a two inch gap through which I can turn the cravat right-side. Before turning the cravat right-sides, I trim the points to an angle, as well as the corner, so it does not bulk (see right). Once turned, I press the cravat to a nice crisp finish (see far right). Lastly, here is a nice packshot of my finished cravat. That's brilliant! A very clever idea. 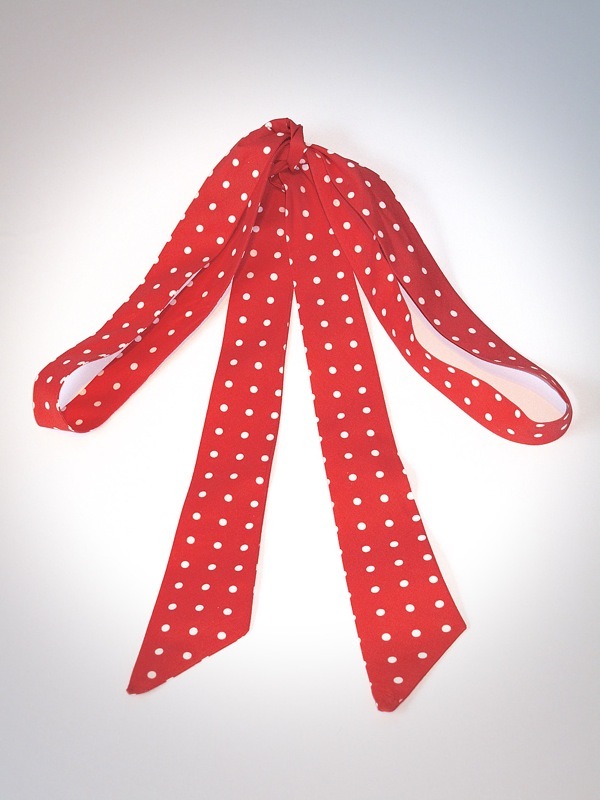 Just one question - how do you actually tie a cravat? Post Office Tower destroyed by aliens!